Everyday Geographies: Do you use online mapping to locate places? If so which ones? 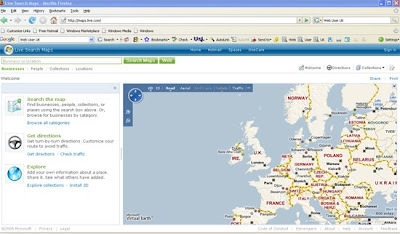 Do you use online mapping to locate places? If so which ones? The current round of voting has now closed. Nineteen people have registered their vote so far – which is pleasing because I recognise that this is a relatively unknown blog. As might be anticipated Google Maps and Google Earth have achieved the highest scores (though only just) and Multi-Map is perhaps beginning to lose out. This overall score reflects my own current use of online mapping as I much prefer Google Maps to the re-vamped version of Multi-map. One programme that is well worth a look is the Microsoft website, variously known as Live Local, Maps Live etc. This has not scored as well as Google maps yet for some parts of the country the satellite views are far more detailed than on Google Maps.